I attended 19 sessions in 4 days and learned oodles. I’ve whittled it all down to just a few memorable takeaways to share with you. Even if you don’t have a particular interest in diabetes, I think all 5 on the list are worth taking a peek at since they go beyond the broader scope of a single disease. This situation is reminiscent of our healthcare system and its focus on treating instead of preventing illness. I think many people feel like they don’t need to worry about their diet until they get a diagnosis of high cholesterol or high blood pressure. But what if we turned that philosophy on its head and tried to keep ourselves healthy in the first place? What if we started choosing healthy lifestyle habits before our bodies started telling us they were sick? Maybe we could do some good. If you know anyone with type 1 diabetes, you’ve seen that technology is a huge part of their treatment. A blood glucose monitor uses specially designed strips to give them a blood sugar reading multiple times a day in under 5 seconds. An insulin pen eliminates the need for carrying around a bottle of insulin and a syringe. And an insulin pump minimizes the number of daily pokes needed to administer the life-saving hormone. And if you know any technology nerds, you know they like solving problems with their giant brains and smart designs. Well, technology continues to advance at a remarkable rate and healthcare is a continuous source of problems that need solving. The next step, the holy grail of diabetes management, would be a closed loop system with a fully automated pump that could detect and remedy blood sugar lows and highs without the patient having to evaluate readings and calculate dosages on their own; in effect, a device that would do what a properly-functioning pancreas would do. After many years of wishing and hoping and waiting, several companies are now in production and they’re optimistically predicting availability of an artificial pancreas in 2 years. The first ones will likely only have insulin, but future models would include other hormones like glucagon and amylin, to more closely resemble a fully functioning blood glucose management system that our bodies rely on. It will be life changing. Other advances the tech geeks are working on? Smart insulin that only works if you need it (which would prevent hypoglycemic episodes when insulin is dosed incorrectly), rapid acting inhaled insulin (which would minimize needle pokes), and administration of encapsulated islet cells (which may be able to replace the damaged pancreatic cells and begin producing insulin again). Genius. …and maybe when you’re older, have previous nutrition knowledge, or are motivated to eat right. Essentially, not everyone is using the labels, or using them in the same way, and not everyone who is using them is understanding them, based on their individual characteristics. 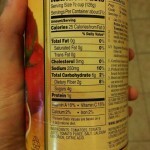 People who look longer at the front-of-package nutrition symbols have higher dietary quality. 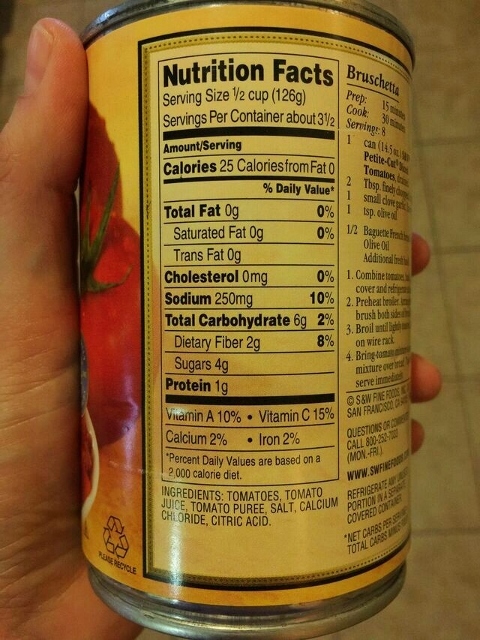 People spend the most time looking at calorie and sodium values. Older adults were less likely to look at serving size but when they paid more attention to this part of the label their nutrition accuracy in decision making was excellent. Accuracy with understanding servings per container depended on numeracy (comfort with numbers and math). Nutrition knowledge and motivation to eat well predicted accuracy across all age groups. There are a lot of numbers on that little rectangle on the side of your peanut butter jar. While it may seem straight forward, this research reminded me that it takes several different types of skills to make sense of it all. In case you’re wondering, his answers to these massive questions pretty much all lead back to your smart phone and making healthcare convenient. 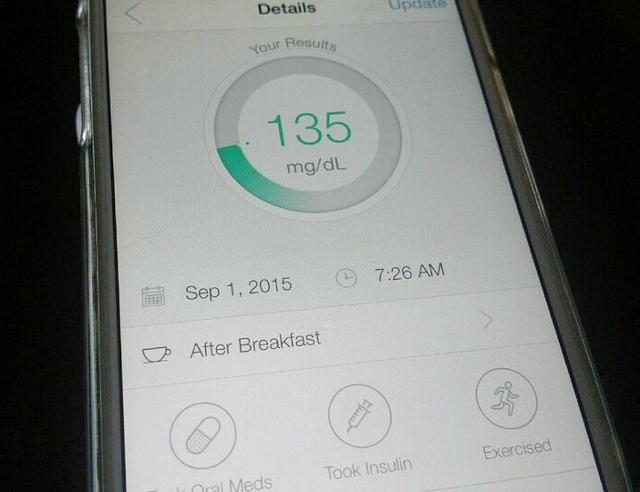 He thinks very soon doctors and dietitians will be prescribing specific health apps to patients. He thinks we’ll start booking appointments with diabetes educators like we make reservations with restaurants using apps modeled after OpenTable, and that we’ll have our medical information scanned from our phone when we walk in the front door of a medical office, instead of spending 15 minutes filling out forms on a clipboard. He also thinks apps like Mood Ring will track our stress level by monitoring our voices while other apps digitally assess our photos to give clues to our happiness levels with certain people and in certain locations and then make suggestions to us when we need to relax. Essentially, because they are constantly with us and capable of so much personal data management, our phones could become the center of our self-care and healthcare universe. I don’t know about you, but I personally find health tracking to be incredibly valuable. 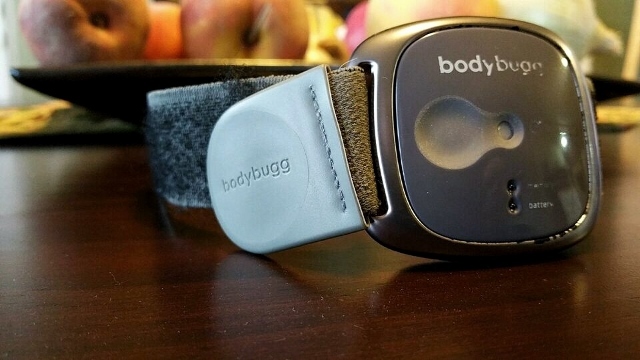 I track calories and nutrient intake on My Fitness Pal, and I wear a Body Bugg to get a handle on my daily calorie expenditure. I feel like I make the best decisions about managing my calcium intake or body weight, for example, if I’m measuring them on a regular basis. That’s right. Dr. Timothy Harlan is changing the face of medical education. 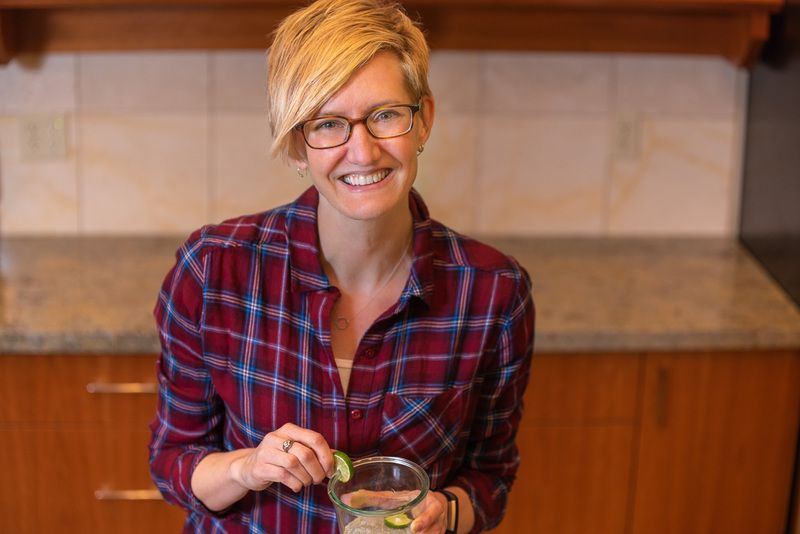 The Goldring Center for Culinary Medicine teaches their medical students about how food choices can affect disease for better or worse, in an actual kitchen. As a result their students are 2.3 times more likely to believe that nutrition counseling should be part of any routine medical appointment, 4 times as likely to understand the potential advantages and disadvantages of a vegetarian diet, and 8 times as likely to understand the Mediterranean diet principles and its health effects. In a country where only one quarter of medical schools offer the recommended 25 hours of nutrition education and physicians are woefully underexposed to nutrition science, this is revolutionary in the best way possible. Maybe I should be concerned, because a lot of this sounds like a dietitian’s job is being given to doctors. But I’m beginning to realize that people need to hear messages multiple times in multiple ways before they stick and actually engender change. And what better way to support a patient than to present a united front as their healthcare team, sharing the same messages? Next on Tulane’s list of innovations? Delivering diabetes education in the kitchen. Instead of just educating someone on healthy food with a handout, they’ll actually be teaching people what to eat by cooking and eating alongside them. You can’t get much better than that. Since the “normal” person in this country is overweight, sedentary, and eating the disease-causing Standard American Diet, then my answer would be a resounding YES! Any items on the list strike a chord with you? Something you maybe want to learn more about? Great, informative post. I’m very interested in T2DM and preventing and/or managing it with diet, as a soon to be RD. Thanks so much for sharing! Hi Angela. Thanks for reading the post…it was a long one! I’m so glad you found it informative. Best of luck on your RD journey! Thanks for the synopsis! Sometimes it seems like there is nothing new, so it’s fun for me to hear your impressions and realize how fast technology is changing, while the basics (move more, eat your greens and beans!) are still the cornerstone of prevention and care. Hi Maryanne. I love your synopsis…”move more, eat your greens and beans”. Short, catchy, memorable. That’s in the running with, “Eat food. Not too much. Mostly plants.” from Michael Pollan. I found this to be very good. I have never been given a C peptide lab test and wonder how important that is? Yes, my doc I see now is an Endo. My first doc, when I org got Dx, was a family M.D. I am a nurse and never knew so much about diabetes!!! It has been a long hall, and a bumpy ride. Every time I think I got it down, it changes or things don’t work that day. 🙂 I will read the article and ask about the lab test at my next check up. Always learning as much as I can to keep things under control.